This undated image released by German surveillance firm Mobotix shows two scientists from the Ev-K2 National Research Council installing a solar-powered webcam to film Mt. Everest from the summit of the nearby Mt. Kala Patthar. The webcam will beam images of Everest across the web which could provide vital clues on the effects of climate change on the Himalayas. The world's highest webcam has been installed in the Nepalese Himalayas, beaming live images of Mount Everest back to scientists studying the effects of climate change on the planet's tallest peak. 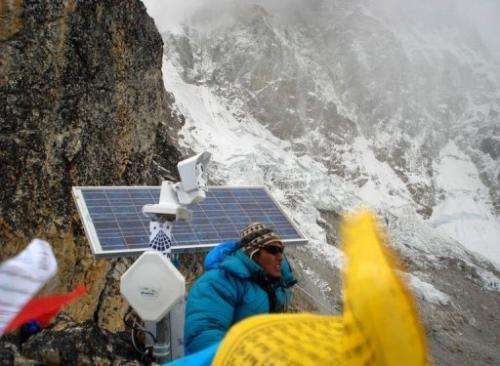 The solar-powered camera, set at 5,675 metres (18,618 feet) on Kala Patthar, a smaller mountain facing Everest, will withstand temperatures as low as minus 30 degrees Celsius (minus 22 Fahrenheit) and operates during daylight hours. The device, developed by German surveillance firm Mobotix, is more than a kilometre higher than the previous record for a high-altitude webcam set by a 4,389-metre-altitude camera at the base camp of Mount Aconcagua in Argentina. "We spent months developing the perfect set-up for the installation and invested a lot of time testing and verifying the system," said Giampietro Kohl of Ev-K2-CNR, the mountain research group which installed the camera. "It inspired us on to set a record: operating the highest webcam in the world." The webcam operates from 6:00 am to 6:00 pm Nepalese time (0015 to 1215 GMT) from the Kala Patthar summit, recording stunning images of 8,848-metre Mount Everest as well as the South Col. The image is updated every five minutes, allowing climatologists to track the movement of the clouds around the mountain's summit. "Researchers selected Kala Patthar as the camera location because it offers an excellent view of the western side of Mount Everest, including the north and southwest faces of the mountain and the West Ridge," a spokesman for Mobotix said in a statement. 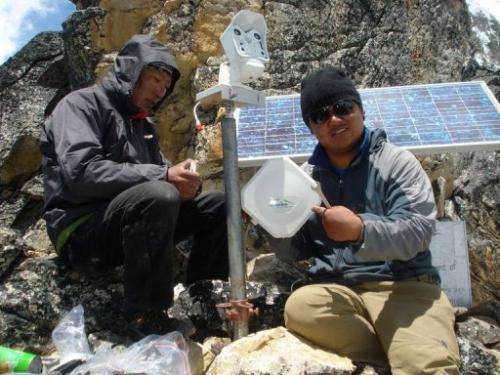 This undated image released by German surveillance firm Mobotix shows scientists from the Ev-K2 National Research Council installing a solar powered webcam at the summit of Mt. Kala Patthar. The webcam operates from 6:00 am to 6:00 pm Nepalese time from the Kala Patthar summit, recording stunning images of 8,848-metre Mt. Everest as well as the South Col. The camera, which went live in September, uses a wireless connection to transmit images to the Ev-K2-CNR Pyramid Laboratory, located at an altitude of 5,050 metres. The footage is then analysed by scientists in Italy who hope to learn more about climate change and global warming using the images in conjunction with meteorological data gathered from Everest. The exact height of the world's tallest peak is also being re-measured in a separate Nepali project attempting to end confusion on the issue. The mountain, which straddles Nepal and China, is generally thought to stand at 8,848 metres after an Indian survey in 1954, but other more recent measurements have varied by several metres. Last year, officials from Nepal and China reached a compromise under which Nepal measured the height of Everest's snowcap at 8,848 metres and China measured the rock peak at 8,844 metres. The final result will be known in two years' time after reference points are set up on Everest and then global-positioning system satellites are used to calculate the precise measurement. The first measurement of Everest was made in 1856. It was conquered in 1953 by Sherpa Tenzing Norgay and Edmund Hillary, and has since been climbed by more than 3,000 people.